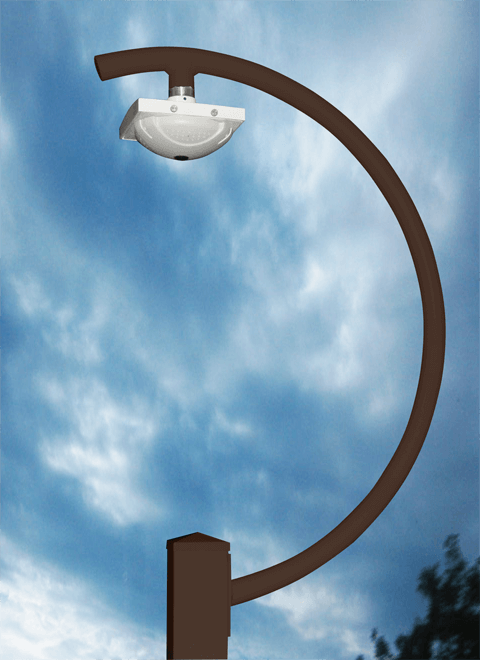 Strong Poles has introduced a new Panoramic Camera Mount designed to screw onto our stylish “Fly-Over Camera Mount”. This square mount can accommodate virtually any Panoramic camera on the market. The 7” square mounting door on the bottom, swings out to make wiring and installation simple and quick. This mount simply screws onto our Fly-Over Camera Mount or to any 1-1/2” NPT pipe threaded pendant mount, and then can be locked into place with the two set screws in the neck. Then you can drop the swing-down door by removing the aluminum thumb screws. This will allow you to drill any access and/or bolt holes in the aluminum door to match the brand and style of camera you have. The recessed area also hides any wiring or connections inside the mount. The result is a sleek, clean mount of your panoramic camera. The door is hinged with stainless steel hinges and fastened with stainless screws. All of our Strong Poles and accessories are constructed with aluminum so that rust and corrosion will never be a problem in the field.